An Ohio winery was never in our life plan, but sometimes things just happen! After we purchased the Wishmaker House, one of our plans was to create a relaxing, enjoyable environment for locals and guests to enjoy in the evenings. There were no liquor licenses available in Bellville, so we had to think outside the box! Thus, Wishmaker House Wines were born. Our son in law, Vic Swisher, was put to the task of learning about winemaking and the legal aspects of acquiring a wine manufacturing license. With the help of some very knowledgeable Ohio winemakers and several years of practice, Vic has made some pretty impressive wines. At the 2015 Ohio Wine competition he received a double Gold for our Moscato ( the highest award) and a silver medal for our Rhubarb and Starry Night. A lot of research was involved and we have spent many weekends visiting wineries, talking with owners and staff, and taking tours to see how other wineries operate. We currently produce about 1,000 gallons of wine per year. All of our wine is made from crushed grapes grown in either Ohio or New York. We currently specialize in regional varietals such as Niagara and Concord. However, our wine bar serves not only our in house wines, but wines from around the world. We also serve delicious food with a focus on fresh and local ingredients. We are very excited to be able to share our wines with you and we hope that you will enjoy spending a relaxing evening in our wine bar or on our patio. 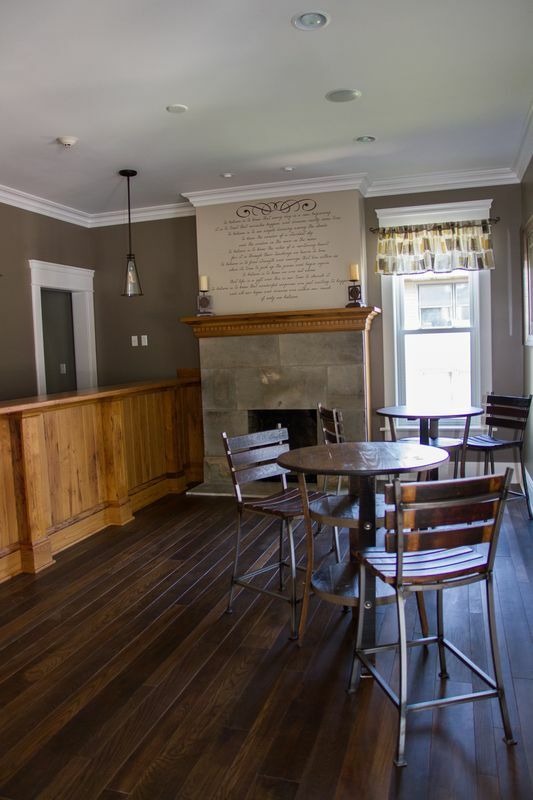 Our winery and wine bar opened on March 21, 2014. Stop in and see what it's all about and enjoy some really great seasonal salads, soups and sandwiches. The winery and restaurant is open 11:00-10:00pm Wednesday, Thursday, Friday, and now open Saturday 11:00am-10:00pm and Sunday 11:00am-8:00pm. Our kitchen closes at 9:00pm Wednesday-Saturday. We do not take reservations for the wine bar or the patio, it is all first come, first serve.